PTSA officers have been hard at work these past two weeks advocating for the needs of Classen SAS MAPS Phase II budget. On Wednesday December 5th, Classen SAS PTSA MAPS Liaison Pam Newby and Classen SAS PTSA President Dixie Hendrix met with OKCPS Board Chairman Angela Monson, OKCPS Superintendent Karl Springer , OKCPS School Board Member Laura Massenet, and two representatives from the District to discuss “moving towards YES” on all of the proposed items in the our MAPS Phase II budget. During this 3 hour meeting, Pam and I heard supportive statements about the importance of Classen SAS to OKCPS from both Chairman Monson and Superintendent Springer. They both acknowledge the unfair allocation of money in the original MAPS budgets, placing Classen SAS lowest on the construction list , with the second lowest budget for the oldest mid/high building in the District. I am pleased to relate that we had hopeful discussions regarding the Classen SAS Phase II budget. OKCPS Board Chairman Angela Monson and OKCPS Superintendent Karl Springer have assured us that all of the Classen SAS Phase II budget items will be funded. The funding will come from a variety of sources -not all through the MAPS program. I have included a letter (PDF) outlining the results of our meeting written by OKCPS Board Chairman Angela Monson. Please take this opportunity to read through this supportive letter. I believe we have to trust that Chairman Monson and Superintendent Springer will be true to their word. Trust, but verify. Classen SAS PTSA will continue to keep an eagle eye out on the status of ALL of these items regardless of where the funding comes from to make sure that Classen gets the items that we need. The best guess of the completion time frame we are looking at is around 2014. To keep the Phase II projects in all of our minds, watch for posters in the hallways at Classen SAS and online at the PTSA website showing ALL the projects with updates on completion. We will add pictures and comments as each project is done. The need to speak with passion at the OKCPS Board meeting on Monday December 10th has passed. In fact, it might actually work against us. 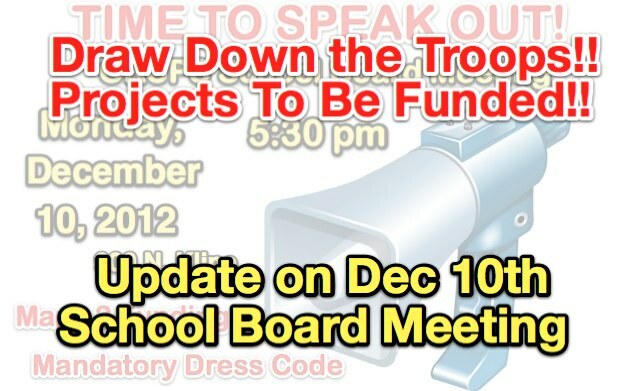 I do encourage as many of the Classen family as possible to attend the December 10th meeting to witness in silent support the passage of a good portion of the Classen SAS Phase II budget items all at once. Remaining items will be included in another budgetary process during an OKCPS Board meeting in January. Look for me in the back row of the OKCPS Administration Building auditorium at 5:30 pm December 10th, 2012. Thank you to all who wrote to the OKCPS Board about this issue…and to everyone who volunteered to speak to the OKCPS Board at the December 10thmeeting. I truly believe EVERYONE’S efforts to address the needs of Classen has enabled this positive outcome. I will keep you posted if I feel that we need additional action to make sure Classen SAS gets all the items on the Phase II budget. Classen SAS has the most incredible support! Thank you, thank you!